Shot on location at The Balenbouche Estate in St. Lucia, Charlie the Yogi created this Yoga sequence for the intermediate to advanced Yoga practitioner. It was designed as a private session on the beach, that can be done in the home. Find yourself relaxed while working on your flexibility and stamina with this vigorous, yet restorative, workout. Your calmness will be enhanced by the sounds of the waves rolling in and out. This DVD can be used as a daily practice, or when you would like to achieve a deep clarity. 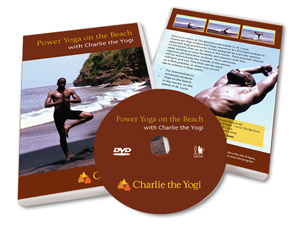 Purchase by clicking "Buy Now"
My "Power Yoga on the Beach" DVD is on sale now! Click for more information. Want to come to one of my classes? Check out my Events page for a listing of all the classes I teach every week.